Czech Republic: Prague: We walk across Karl’s Bridge with Jacky and Jörg and go to a restaurant under the abutments on the far side. Like walking into a grotto. Who had sat in my seat in the past? I can’t recall the food. The next day I find an art shop and buy a print of the bridge. It now hangs in my dining room and each time I look at it I am reminded of the restaurant, the castle up on the hill, and the artists working along the bridge. 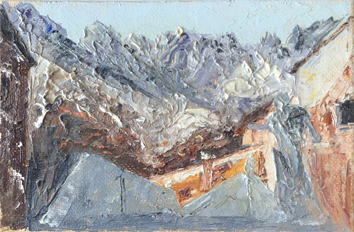 Italy: Carrara: Cavi di marma loom, white marble glinting in the sun, the road narrow and twisty as we rise in our little rented car above San Pietro. At the end of the road, a small town — Colonnata —full of old men in the square, all with some visible disability (seemed like I was visiting some home/place for the disabled) ..found out they were all local, hurt in accidents from their mining work. A monument honoring the men and the marble stands at the edge of town. Intermittent dynamiting disturbs the quiet little town. How difficult must it have been without modern technology during Michelangelo’s time! Germany: Bergisch Gladbach: A small gathering at the home of Heinrich and Christiane Jarczyk celebrating Heinz’s 70th birthday, several of the people “new” to us, apparently friends and neighbors who were outside his artistic circle. At one point during the evening, an elderly gentleman, ramrod strait and very formal, remarked to me in a clipped and precise Oxford-English, “You call him Heinz?” “Yes,” I said somewhat lightly. “That’s his name.” The old man — I could picture him with a monocle and fencing scar — pulled back his head and said emphatically, “I know Herr Doktor Jarczyk for almost twenty years — and I do not call him (a slight hesitation here) ‘Heinz’.” I shrugged. “Well, I’m American, you see. We do not stand on such ceremonies. We are friends and he calls me ‘Ray’, and I call him ‘Heinz’.” I bowed slightly to his rigid glare and moved to take part in another nearby conversation. He did not deign to speak to me again for the rest of the evening. Japan: Narita International Airport: On our departure flight from Japan to Beijing I was watching out my window as we taxied to our runway and noted a line of workers — baggage handlers? I was not sure, but they were all dressed in a white, work uniform — facing our plane and, as we taxied by, bowing deeply at the waist. I’d never seen anything like that and, to this day, do not know if it was a customary farewell to all airlines or was there perhaps some political VIP up in first class. Whatever, it was an extraordinary sight and strangely comforting to me as we took our leave. Switzerland: Brenner Pass: While traveling from Germany to Italy, we passed some ski slopes and, I as I looked over at the Lodge at the bottom of the mountain, I noted a hospital nearby!!! How fitting! No wonder I never took up the sport!! 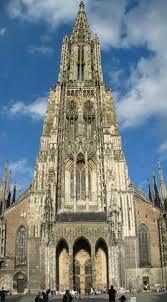 Germany: Ulm: a church steeple (the tallest in Europe) made of stone. From a distance, it looks like the finest of lace! How had those stonemasons performed this miracle? What artists they were! Did they impress God with their handiwork as He did them? And what did Einstein — who was born here — think of it? Makes one marvel at so many artists of today who make sure they sign their most trivial of “artworks”. Austria: Vienna: Visited, of course, the Hof, the Albertina (big disappointment! ), the Winter Riding School, Schönbrunn and other “tourist spots”, but it was a coffee house a few steps away from the Hofburg that I most remember: spacious, high-ceilinged, tables with ample room for waiters in black and white to glide between them, newspapers (none of which I could read) hanging from bamboo poles. It was midday yet most tables were occupied by readers and journal writers…a smattering of tourists like myself. I somehow felt the souls of departed novelists, memoirists, revolutionaries, poets, students, pamphleteers, professors, anarchists, and other disillusioned persons hovering nearby, looking over my shoulder and wondering why I was merely gawking and not writing. Italy: Rome: Piero (Pier Augusto Breccia) takes us to a restaurant outside city limits: Rustic, ancient, overhead wooden beams hung with farm/hunting implements. The menu: wild game. Expecting wild animals, I was still surprised to see “Bambi” featured on the menu. Germany: Bergisch Gladbach: It was May and not a time we usually go to Europe, but I was invited for a book discussion/signing for my monograph on Heinz (Heinrich J. Jarczyk: Toward a Vision of Wholeness) at Cologne’s Amerika Haus so our Spring visit was a special one. What made it even more memorable for me, was a stroll down the street on which the Jarczyks lived, each side lined with flowering plum trees, all in full bloom and the sidewalks covered in pink petals. It was almost like walking down a “red carpet”, the little town welcoming us as “super stars” from the U.S. A very nice memory indeed. (Note: I met Heinrich J. Jarczyk during his exhibition at the German Embassy in NYC and later wrote about him in ART TIMES; sometime later, I also wrote two books about his life and work. We visited (and became long-time friends) with him and his wife, Christiane, many times in Germany). LET’S MAKE “GREAT” GREAT AGAIN! WELL, HERE WE go again…some “visionary” wants to put his/her name on the world stage, engraving his/her name “in stone” for prosperity. We’ve been digging up such graven stones for some years now— even publicizing them in more modern ways such as “histories” written in print, for example — but the “posterity” business seems to constantly elude both givers and receivers of the message. In other words, the invariability of our having to re-live “history” because we ‘forget’ it. Would that our present-day pundits would read a book or two before declaiming their stupidities to the world at large. Such ‘mouthers’ — at times called “wise men”, or “prophets”, or “soothsayers” – even “oracles” — have plagued mankind for, lo, these many centuries, with their silly utterances. Oh, would that they pick up a book and read. Let alone our present “leader” and his proclamation of ‘greatening’ again (Oy! Another prophet! — Is that the sound of knickers twisting that I hear across the land?). Meanwhile we have to listen to another sooth-saying pundit announce to us that such proclamation sounds “Hitlerian”! Really! Read a book for gawd’s (or, better yet, our) sake! If anything, it simply sounds redundantly and embarrassingly human! Centuries before that dim-witted Austrian yelled “Deutschland uber Alles”ˆ, ancient egoists had been chanting similar absurdities thousands of years ago…and their predictions (“proclamations”, “warnings”, “fantasies” “greatness” claims, even “Divinity” at times ((really bad times))…whatever)…were as valid then as they still prove to be—namely, nothing but bulls—t. Dreams of former “greatness” will undoubtedly not only plague Putin, but scores of new blowhards as well. You don’t think that Iran ever hearkens back to the Persian worldwide empire? Or Italy to its Roman Empire days? Or Greece (now one of the weakest/poorest members of the E.U.) to “back in the day”? How about France and the hey-day of Napoleon? Spain — when its tentacles reached across the Atlantic? Brits and their colonial “Empire”? And how about Native Americans and their attempts to hold sway over our blasphemous ‘immigrant’ pipelines? Let’s not even talk about the “religions” and their claims of coming “on from High.” Oh yeah! Let’s make America “great” again! As one former would-be ‘leader’ once said, “It depends on what the meaning of the word ‘great’ means” — or something like that. How about we try this time to make our species “great”? That’s never been tried yet. Instead of trying to make our tribe “great”, how about we begin to make mankind great by learning something about our entire history? How about we take a long, hard look at that word “great” – or maybe even the word “human”? You are currently browsing the Raymond J. Steiner's Blog blog archives for February, 2017.